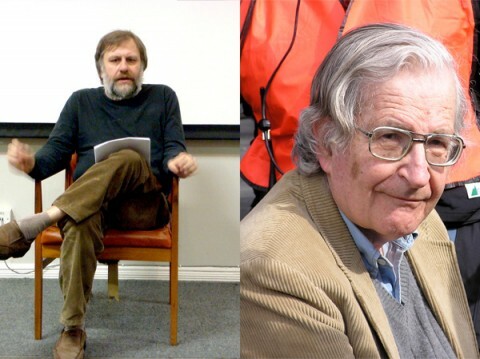 Noam Chomsky has issued a statement in reaction to our July 17 post, "Slavoj Žižek Responds to Noam Chomsky: 'I Don't Know a Guy Who Was So Often Empirically Wrong.' In an article posted yesterday on ZNet titled "Fantasies," Chomsky says Žižek's criticism of him is completely ungrounded. "Žižek finds nothing, literally nothing, that is empirically wrong," writes Chomsky. "That's hardly a surprise." I had read it, with some interest, hoping to learn something from it, and given the title, to find some errors that should be corrected -- of course they exist in virtually anything that reaches print, even technical scholarly monographs, as one can see by reading reviews in professional journals. And when I find them or am informed about them I correct them. Chomsky goes on to recount an instance when he says Žižek misattributed a "racist comment on Obama" to Chomsky, only to explain it away later and say that he had discussed the issue with Chomsky on the telephone. "Of course," writes Chomsky, "sheer fantasy." Chomsky then moves on to Žižek’s comments reported by Open Culture, which he says are typical of Žižek’s methods. "According to him," writes Chomsky, "I claim that 'we don't need any critique of ideology' -- that is, we don't need what I've devoted enormous efforts to for many years. His evidence? He heard that from some people who talked to me. Sheer fantasy again, but another indication of his concept of empirical fact and rational discussion." Chomsky devotes the rest of his article to defending his work with Edward Herman on the Khmer Rouge atrocities. He claims that no factual errors have been found in their work on the subject, and he draws attention to a passage in their book After the Cataclysm, quoted last week by Open Culture reader Poyâ Pâkzâd, in which they write, "our primary concern here is not to establish the facts with regard to postwar Indochina, but rather to investigate their refraction through the prism of Western ideology, a very different task." You can read Chomsky's complete rebuttal to Žižek here. I have to take exception to your headline here. It gives the impression that the two intellectuals are just calling each other names. But of course the substance of Chomsky’s response is that Žižek has claimed to have found errors, but hasn’t actually justified this claim. It’s unfortunate that Chomsky goes on to use a pejorative term to refer to Žižek’s claims, and even more unfortunate that you choose to mention that pejorative, rather than summarizing the substance Chomsky’s response. I suppose it draws more clicks, but presumably anybody who’s following Open Culture is at least a bit more discerning than the average surfer. Am I the only one who would like to see a public debate between these two? In the audio comments Chomsky says he would have little interest in having a talk with Zizek, and says he assumes Zizek has no interest as well. So I don’t see an actual debate occurring anytime soon. I don’t know why Chomsky spends his time responding to a charlatan in the first place, while there are still many serious scientific and political issues to address. I am learning that intellectuals can quote a lot of info but they don’t seem to like to get their hands dirty. I would rather hang around people who aren’t “intellectuals” and like,to get their hands dirty. It is dissapointing, in Zizek’s excitement, he didn’t address the accusation of charlatanism. Chomsky is philosophically ignorant. Judging from the ambiguity of Chomsky’s grammatical structure, it sounds like the disagreement is narcissistic and self congratulatory. I would have to go back and read/listen to the Zizek, but then, isn’t everything he says narcissistic and self congratulatory, har har. But seriously, to declare an all time winner, I’m going to go with either Slavok Chomsky or Noam Zizek (is this thing on?). But seriously, can you say catty. I haven’t seen two grown men argue so violently about nothing since they forgot to fill the trojan horse with soldiers, hehehe, is this thing on? But seriously, I think there’s something going on behind the scenes here. Like there are Noams and Noam Noams, but what are the unNoam Noams!!!HELLO! IS THIS THING ON!!!! Why is theory only something a scientist can do? I thought the word had a much wider application than that? I am would rather talk about science, and what science does, than loose talk about theory. What is your interest in keeping this meaningless argument going. It doesn’t really contain anything of any interest. They are never going to agree are they? Thx for the mention. I couldn’t believe my eyes, when I saw Chomsky’s reference. Made my day to be honest. I’ve read this three times and I have no idea what you mean. It’s a bit like reading Zizek in that regard. At this point in his career, Chomsky doesn’t have to defend himself against slights regarding his ability to read and understand things. He (and his interlocutor) do need to address substantive issues, and for him the substantive issue is that Zizek is a shallow, hollow voice whose endless pronouncements can’t be parsed for actual meaning. If Chomsky says that he’s tried to do so, I believe that he has, because he’d rather defeat Zizek on the substance of what he says. But if he finds no substance, then “charlatan” is a fair use of the term. Zizek’s rejoinder is completely empty; criticising Chomsky on issues unrelated to his thought. Zizek’s basic tool is to make Chomsky’s pronouncements on the Khmer Rouge synonymous with approval: that wasn’t the case then, and certainly not now, but if he made a mistake, well at least he was making statements that can be held up against a standard of verifiability, unlike Zizek. I think the exact opposite. Curious. Chomsky did have a ‘theory’ once but seems to have left it behind. It was called Manufacturing Consent, basically an argument for an NPR or a BBC as opposed to private media with its commercial biases. It is couched in a scientific positivist format. Now he merely writes one darn fact after another, often with the rhetorical gesture of quoting the facts from the enemy, the Financial Times etc. It would be as if Das Kapital merely listed factory conditions, without explaining how people come to believe or are forced into accepting these conditions as the natural way of life. Zizek’s problem is sometimes compartmentalization: this is metaphysics, eg, concept of non-all; this is politics, healthcare; and this is Lacan. His books tail off into digressions, and dead ends, ok the tv is laughing for me, nice, but so what. An encyclopedia in three parts would be nice. it’s funny: I was excited by the prospect of Zizek when I saw his documentary on film. then, the more I read or heard him say, the more I lost interest. I’m really suprised that Chomsky even bothered to comment on him at this point… lol! I did not find that analysis at Znet helpful. He repeats this notion that an indifferent 12 year old is the benchmark for someone who has spent decades studying French, German, Italian, and English philosophy. Would you expect that of any other academic group, rocket scientists? Medics? Map makers? The whole thing is a confusion of roles, Chomsky has the role of a journalist, he does not read philosophy, science or theory. He was a scientist, but that is in the past, it was a different science anyhow, linguistics. It is in fact Chomsky who poses as the philosopher! And why not since he’s very good at it. Now Zizek also does journalism and without those polysyllabic words like “marmalade”. I’d defy anyone on here not to understand them. Inevitably in his philosophical writings terms of art, references to complex authors etc., will appear, and it is expected that certain theory is already understood by the reader, like a basic knowledge of philosophy or access to such work. But you should not expect pure clarity about matters that are in their very reality muddy and abstract. Chomsky’s political statements are neither scientific nor emperical. They serve a useful purpose snd that is we must constantly look at both sides, Chomski’s political statements are suposed to be part of sny debate.